The UK’s exit from the EU will be on the minds of European power market participants heading up to the March deadline. 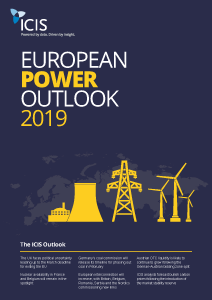 The UK’s future in the internal energy market remains uncertain and could conceivably crash out in the event of a no-deal Brexit. A number of countries will continue to progressively phase out fossil fuel-fired generation, with the German coal commission expected to release its timeline in February. ICIS analysts forecast bullishness on the European carbon market during 2019, after the introduction of the market stability reserve artificially tightened supply in January. Bullish carbon is expected to continue to be a key driver of European power prices.